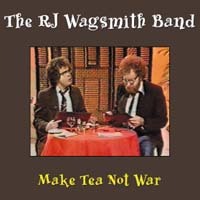 The RJ Wagsmith Band is essentially bass legend/composer MO FOSTER and comedy actor/writer MIKE WALLING. Mo has played with practically everyone – PHIL COLLINS, JEFF BECK, GIL EVANS, VAN MORRISON, GERRY RAFFERTY, AFFINITY – the list goes on. Mike has appeared in loads of sitcoms, notably as Eric in “Brush Strokes”. He has also written for “The Brittas Empire”, “Birds Of A Feather”, “A Prince Among Men” and many more. Mike did most of the voices while Mo played most of the musical instruments and, with the help of guest musicians and actors, the Wagsmiths produced a string of novelty singles including “Chalk Dust” which they credited to The BRAT and was a memorable UK Top 20 Hit during 1982 with ROGER KITTER posing as The Brat. The RJ Wagsmith band comprised legendary bassist Mo Foster and comedy actor/writer Mike Walling, best known as Eric in the sitcom Brush Strokes and this album collects together the string of novelty/comedy singles they released. The album is a compilation of material from 1981 to 1991...it is harmless, relatively inoffensive and quite childish. ...The sleeve warns that 'this CD contains material of a flatulent and silly nature,' and it does not lie. Although it's not your conventional sort of album it's great fun.